The US State Department has canceled a Program that Allowed Refugees from Africa to be reunited With Family Members. Wait until you hear the reason why!!!!!! Since the United States started this Program Thousands of Africans have been Granted Safe Status within our borders. The Program then offers a chance for their immediate family members to join them here in America. The Program has hit a major snag: The State Department recently announced that a majority of those tested did not have Family Relations WITHIN the United States. Initial DNA Testing was carried out on 500 Applicants seeking to get Asylum in the United States. 80% (That is 400 Individuals) were found NOT to have Family Relations currently residing in the United States. 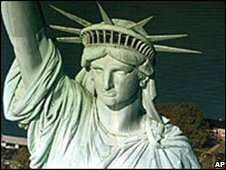 The Statue of Liberty has been a Welcome Sight to those fleeing violence and wishing to start a new life. Some have sought to gain entry here by illicit means. The Nationalities of those that were initially tested were Kenyans and Ethiopians. Both Country provide ample evidence to allow for the program to move forward. Kenya had Elections in December 2007 that led to violence in January 2008. Ethiopia has a myriad of problems including a drought, a Repressive Government and a Military Intervention in neighboring Somalia. After this round of testing revealed the results the testing program was expanded to include the following countries: Ethiopia,Ghana,Gambia,Uganda,Guinea and the Ivory Coast. With the Exception of the Ivory Coast Testing which had a smaller testing pool most of the other testing revealed similar levels of Fraud. The testing found that levels of relationships that were claimed were false. The P3(Priority 3) Program has been in place since 1990. One has to wonder when the voices screaming that "Al-Qaida and their minions have been using this program to infiltrate the country" will start their rhetoric. But the sad thing is that in some instance they may be right. And that is a bone chilling thought.